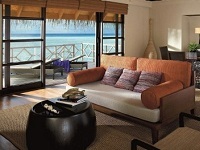 Relax in an atmosphere of soothing seclusion. 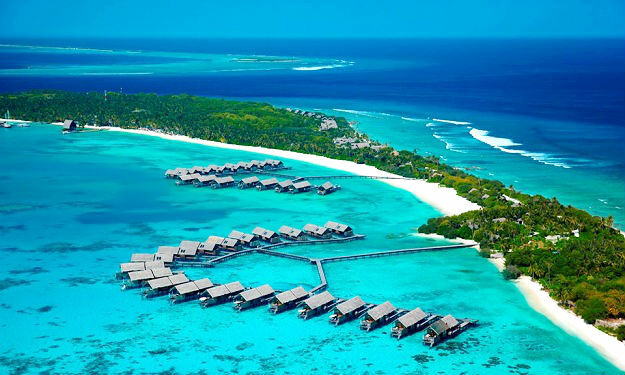 Sunrise Water Bungalows at Four Seasons Resort Maldives at Kuda Huraa are raised on stilts above the gorgeous turquoise lagoon. 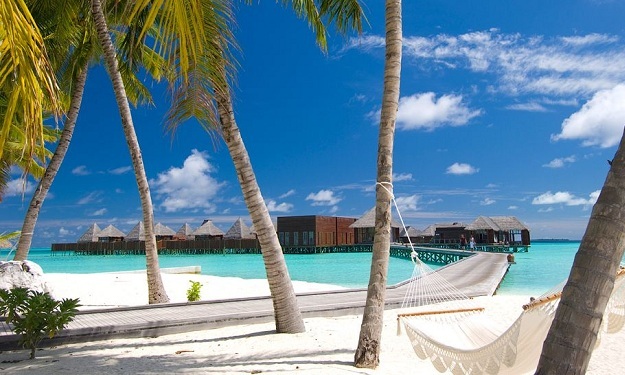 Beds One king bed or two twin beds Occupancy 3 adults, or 2 adults and 1 child notes Extra bed One daybed Location On stilts over the lagoon View Ocean, lagoon and sunrise Size 61 m2 (657 sq.ft.) Bathrooms One full bathroom, plus an outdoor shower. 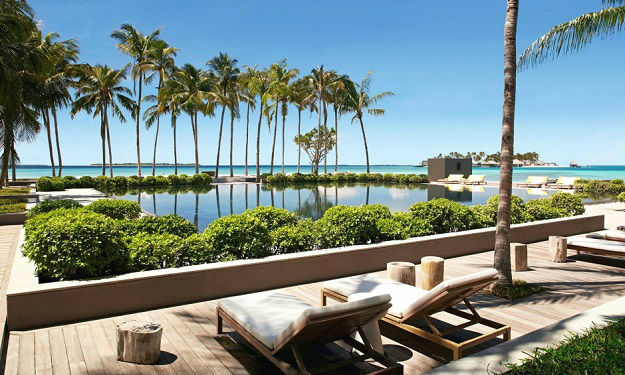 Relax in an atmosphere of soothing seclusion. 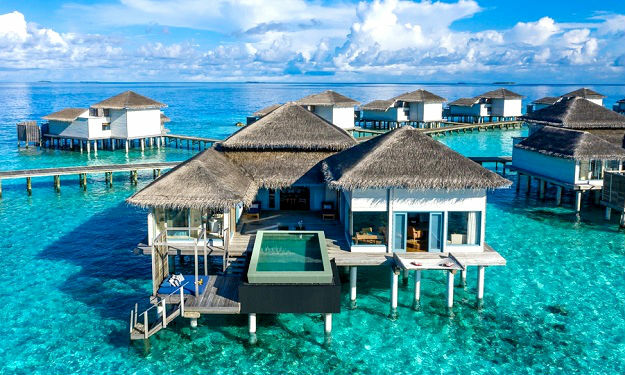 These bungalows at Four Seasons Resort Maldives at Kuda Huraa are raised on stilts above the gorgeous turquoise lagoon and feature a private pool. 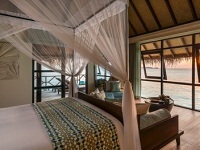 Beds One king bed Occupancy 3 adults, or 2 adults and 2 children* notes Extra bed One daybed Location On stilts over the lagoon View Ocean, lagoon and sunrise Size 61 m2 (657 sq.ft.) Bathrooms One full bathroom, plus an outdoor shower. 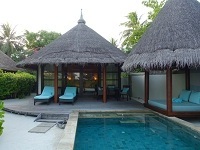 Sunset Family Beach Bungalows with Pool feature a deck with an infinity-edge plunge pool and a shaded bale (traditional thatched hut), as well as an adjoining study with a sofabed – making them ideal for families with small children. Beds One queen bed Occupancy 3 adults, or 2 adults and 3 children* notes Extra bed One daybed and one crib Location Steps from the beach View Ocean, lagoon and sunrise Size 75 m2 (807 sq.ft.) Bathrooms One full bathroom, plus an outdoor shower. 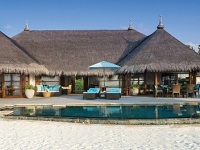 Just steps from the ocean, Beach Pavilions with Pool at Four Seasons Resort Maldives at Kuda Huraa offer elegant comfort, indoors and out. Beds One king bed or two twin beds Occupancy 2 adults, or 2 adults and 1 child notes Extra bed One rollaway or one crib Location Steps from the beach View Ocean and lagoon Bathrooms One full bathroom, plus an outdoor shower. 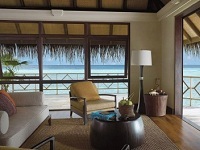 A secluded oasis with its own stretch of beach, the luxurious Two-Bedroom Royal Beach Villa at Four Seasons Resort Maldives at Kuda Huraa provides gracious beachside living for families and Resort guests requiring extra space. Beds One king bed and two twin beds Occupancy 4 adults, or 4 adults and 2 children notes Extra bed One rollaway and one crib per bedroom Location Steps from the beach View Ocean and lagoon Size 197 m2 (2,120 sq.ft.) Bathrooms Two full bathrooms, plus an outdoor garden shower. 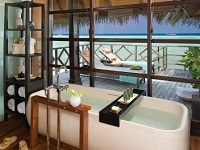 Enjoy painted panoramas of sun, sea and sky from lavish Sunset Two-Bedroom Water Suites at Four Seasons Resort Maldives at Kuda Huraa. 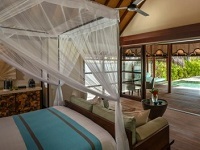 Beds One king bed and two twin beds Occupancy 4 adults, or 4 adults and 2 children notes Extra bed Two daybeds Location On stilts over the lagoon View Ocean, lagoon and sunset Size 173 m2 (1,862 sq.ft.) Bathrooms Two full bathrooms and a guest powder room with shower, plus an outdoor shower. 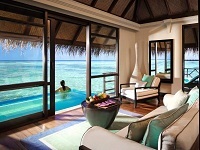 Enjoy mesmerizing panoramas of sun, sea and sky from lavish Sunrise Two-Bedroom Water Suites at Four Seasons Resort Maldives at Kuda Huraa. 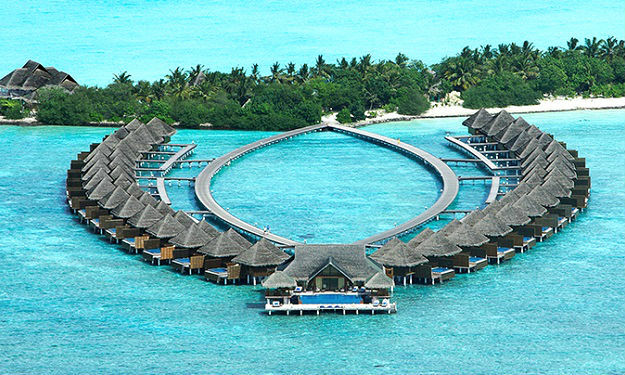 Beds One king bed and two twin beds Occupancy 4 adults, or 4 adults and 2 children notes Extra bed Two daybeds Location On stilts over the lagoon View Ocean, lagoon and sunrise Size 173 m2 (1,862 sq.ft.) Bathrooms Two full bathrooms and a guest powder room with shower, plus an outdoor shower. 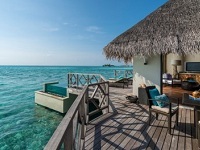 Sunset One-Bedroom Water Suites at Four Seasons Resort Maldives at Kuda Huraa seem to float above the turquoise waters of the Indian Ocean, open to the endless horizon. Beds One king bed Occupancy 3 adults, or 2 adults and 1 child notes Extra bed One daybed Location On stilts over the lagoon View Ocean, lagoon and sunset Size 91 m2 (980 sq.ft.) Bathrooms One full bathroom and a guest powder room with shower, plus an outdoor shower. 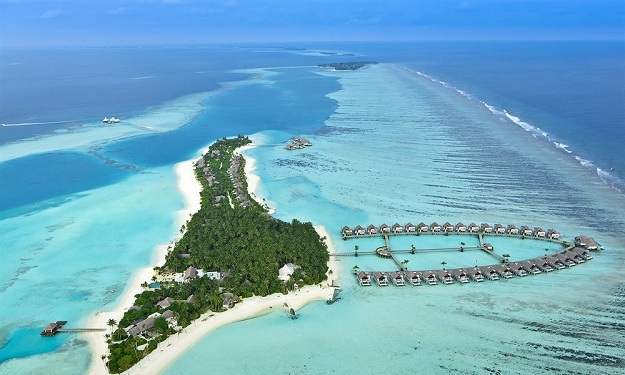 Sunrise One-Bedroom Water Suites at Four Seasons Resort Maldives at Kuda Huraa appear to float above the turquoise waters of the Indian Ocean, open to the endless horizon. One king bed Occupancy 3 adults, or 2 adults and 1 child notes Extra bed One daybed Location On stilts over the lagoon View Ocean, lagoon and sunrise Size 91 m2 (980 sq.ft.) Bathrooms One full bathroom and a guest powder room with shower, plus an outdoor shower. 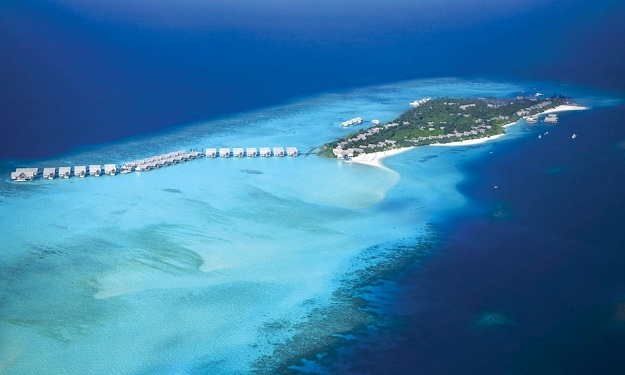 Known internationally as one of the world's best scuba diving destinations, the Maldives has an abundance of dive sites with one thrilling dive opportunity after another. 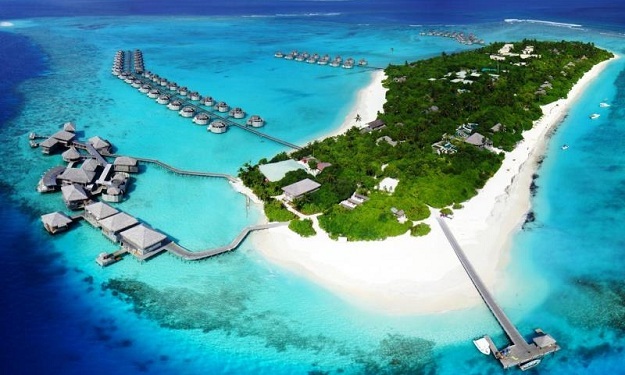 The waters surrounding Four Seasons Resort Maldives at Kuda Huraa and the Baa Atoll UNESCO World Biosphere Reserve, home to Four Seasons Resort Maldives at Landaa Giraavaru, have consistently warm waters with outstanding visibility. 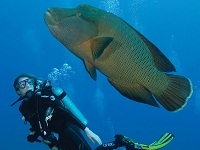 ach of the Resorts' PADI Five-Star IDC Centres offers a two-tank morning dive and a one-tank afternoon dive, as well as sunrise, night and other specialty dives, available on request. 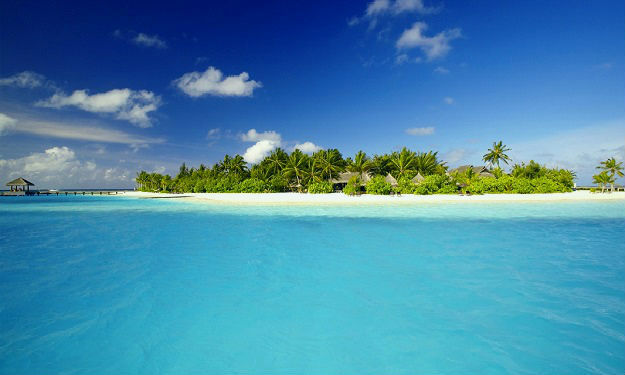 At Kuda Huraa, unforgettable land and water diversions beckon. The Water Sports Centre offers a wide range of group and individual activities to suit all age groups and interests. 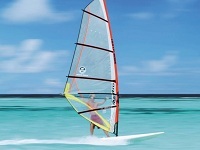 Non-motorised activities such as kayaking and windsurfing are complimentary. 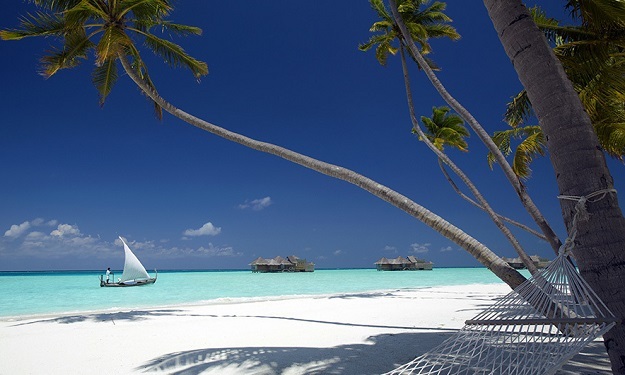 Motorised activities such as water skiing and parasailing are available for an applicable charge. Motorised water sports The following motorised water sports and equipment are available (fees apply): Parasailing (solo or tandem) Jet Skiing Wakeboarding Wakeskating Waterskiing Kneeboarding Fun tubes Banana rides The lagoon on the island's sunrise side is shallow and home to coral reefs, making it ideal for snorkelers. On the sunset side, the water is deeper and ideal for swimming. Sunset fishing: A fishing rod and some bait are all you need to participate in the sunset fishing experience. Catch one if you can, and chefs will be delighted to prepare it to your liking. The excursion takes about two hours by dhoni. 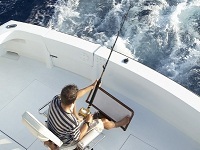 Big game fishing: Reel in a big tuna, sailfish or mahi mahi from the 16.7-metre (55-foot) High Flyer, a sport fishing boat specially designed for big game fishing on the high seas. Unmatched by any other boat in the area, the luxuriously furnished High Flyer features an 81-centimetre (32-inch) flat-screen television, surround-sound MP3 music system and other advanced amenities. Set lunches are served on board. 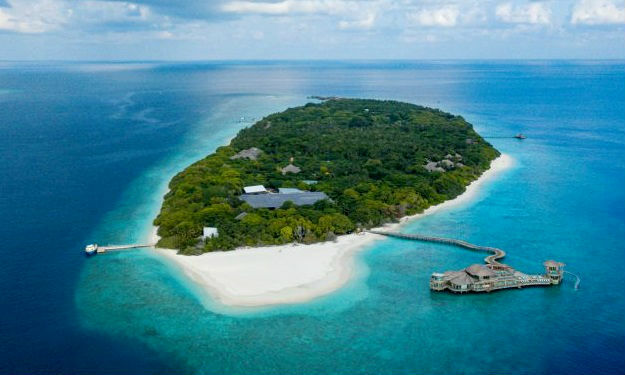 Guests may choose a full-day (8-hour), or half-day (four-hour) charter package. 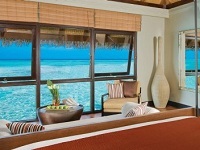 Dolphin talk and dolphin-watching cruise: Hundreds of dolphins live in the waters near Kuda Huraa. Join one of the marine biologists for a short briefing on this fascinating marine animal, then hop on board a speedboat and cruise into the sunset, watching schools of dolphins swimming around you. This excursion takes about 2 hours. 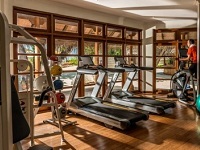 The Gym is a state-of-the-art fitness facility featuring floor-to-ceiling windows, full-length mirrors, a surround-sound music system, fitness equipment and the latest cardiovascular machines with individual flat-screen televisions. Take a break from aquatic activities to practise your tennis skills or take lessons from on-site tennis pro. 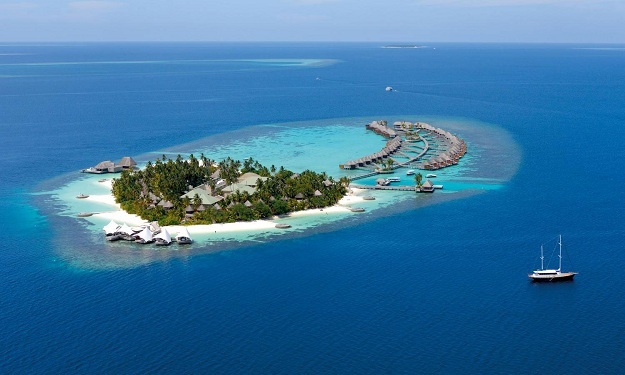 Uniquely located on a neighbouring island, the Resort's tennis court is accessed by a one minute sail on a traditional Maldivian wooden boat dhoni across the lagoon. The outdoor tennis court is lit for night play, and complimentary tennis racquets and balls are available. 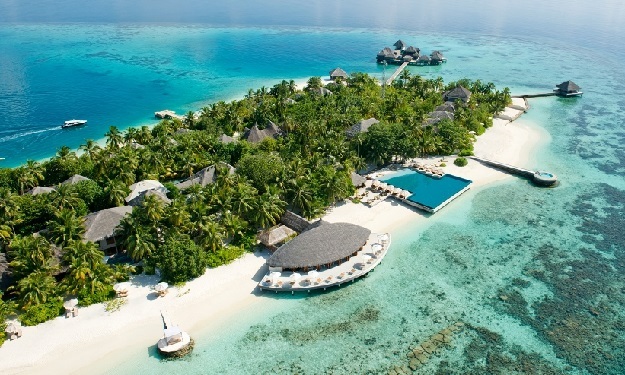 At Four Seasons Resort Maldives at Kuda Huraa, the beauty of an intimate garden island meets signature Four Seasons service for the destination wedding of your dreams. 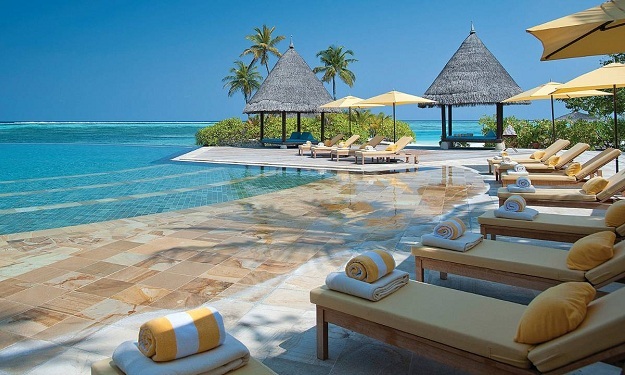 From invitations to wedding cakes, floral creations to memorable farewells, trust Four Seasons Resort Maldives at Kuda Huraa to simplify your planning and make your wedding day everything you have ever imagined. Wedding specialist A Four Seasons on-site expert will work with you or your wedding consultant to reserve your dates, plan the schedule of events and coordinate all food and beverage details, as well as assist with other aspects of your wedding experience at the Resort. 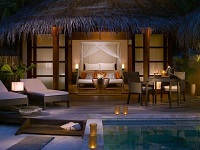 Wedding services Four Seasons Resort Maldives at Kuda Huraa can arrange an unforgettable ceremony in your bungalow, or on our magnificent tropical pool island surrounded by azure waters. 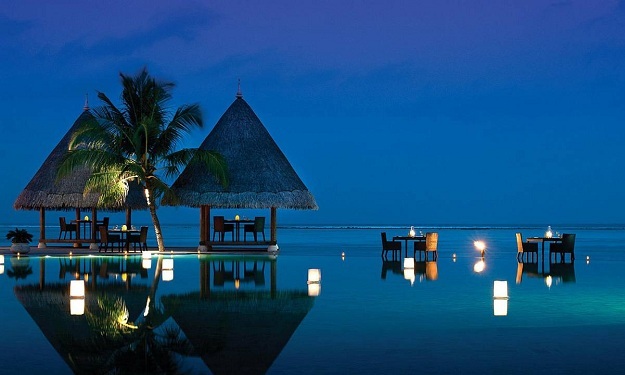 Sunset cocktails, a beach barbecue buffet, a themed-night party or an elegant dinner in one of our romantic restaurants are all typical Four Seasons Maldives experiences. 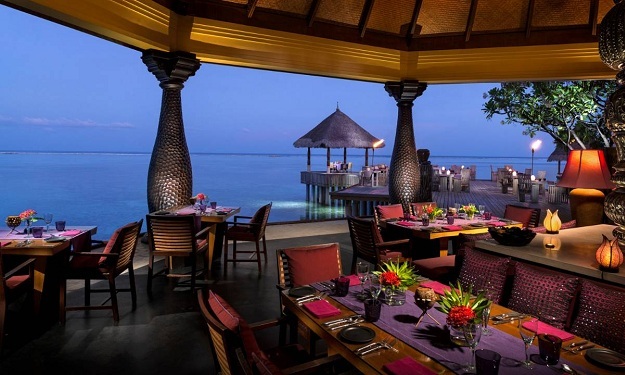 For loved ones and friends present, the Resort is delighted to cater to their dining needs after the happy event. An exceptional menu is always part of Four Seasons dining, but for special occasions, a unique setting can make it even more memorable. Choose from a dreamy dinner under the stars, a meal in a private gazebo perched over the water, a sumptuous beach barbecue, and more.